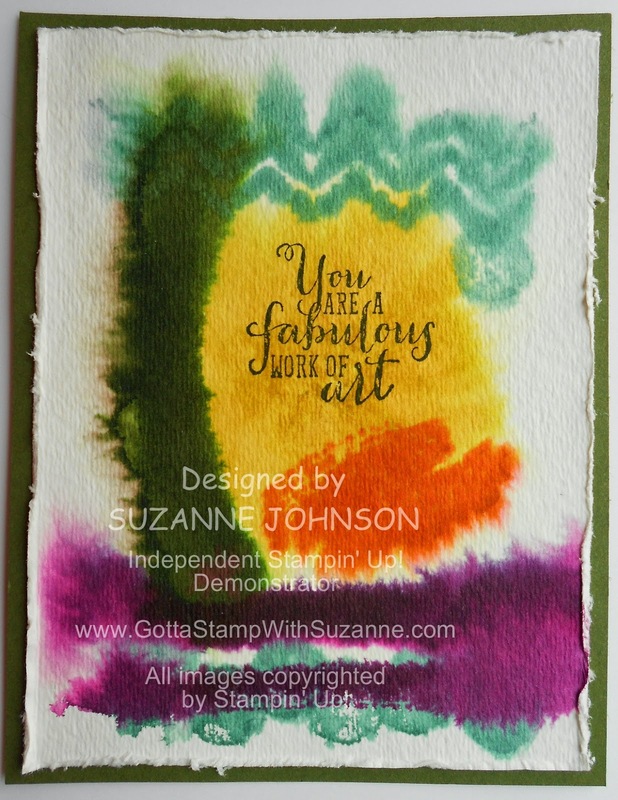 GOTTA STAMP WITH SUZANNE JOHNSON: HOME AGAIN & GETTING IN COLORFUL! I apologize for being absent here since returning from California - but I will make it up to you with lots of new projects! I have started creating cards for my next In Color event. I'll be posting them over the next few days for your inspiration! I cannot go to the Stampin' Up! Convention this year, but working on this challenge to create with the old and new In Colors is rather like swapping with myself! My friend and fellow demo Gina says this set is like Legos for stampers - and she is so right! Once I started playing with it, I had the best time "building" pictures. I have not seen that anyone else has done the designs I am sharing here, so for me they are my originals and I am so proud of them! I look forward to reading your comments and finding out what you think! I have named the more abstract images in the set: "long swipe," "square swipe," and "blotch." The others are more standard: line, chevron, dot and heart. Let's start with a quick and easy shape - a heart! 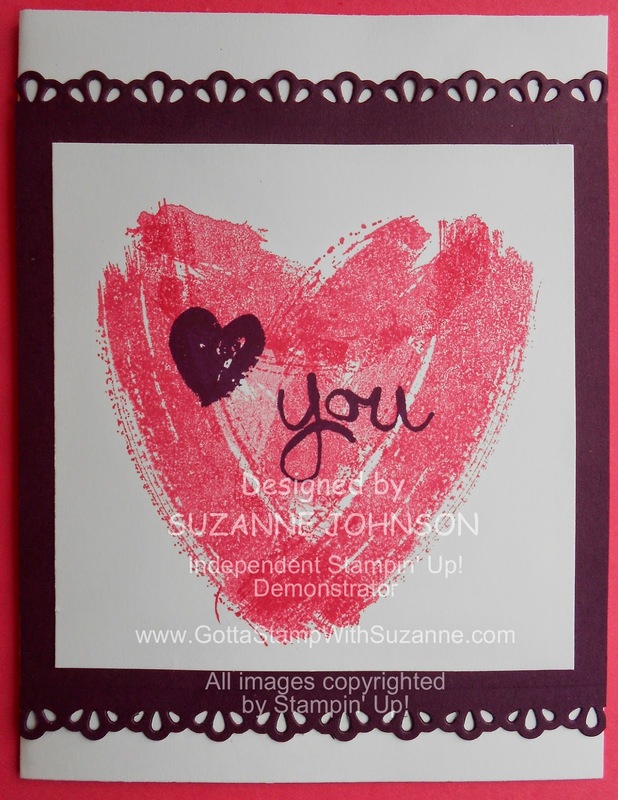 I made this using the "long swipe" and the "blotch" images, and stamped-off before stamping each to lighten the color on the heart so the over-stamped heart & word can be seen. The first version is monochrome with Strawberry Slush. I went over the word "you" with Dazzling Details, and also used it to outline the little heart and the sponged edge of the white panel. The next variation pairs the new In Color Blackberry Bliss with the Strawberry Slush. The background panel was decoratively edged with one of the Finishing Touches Edgelits and the Big Shot. 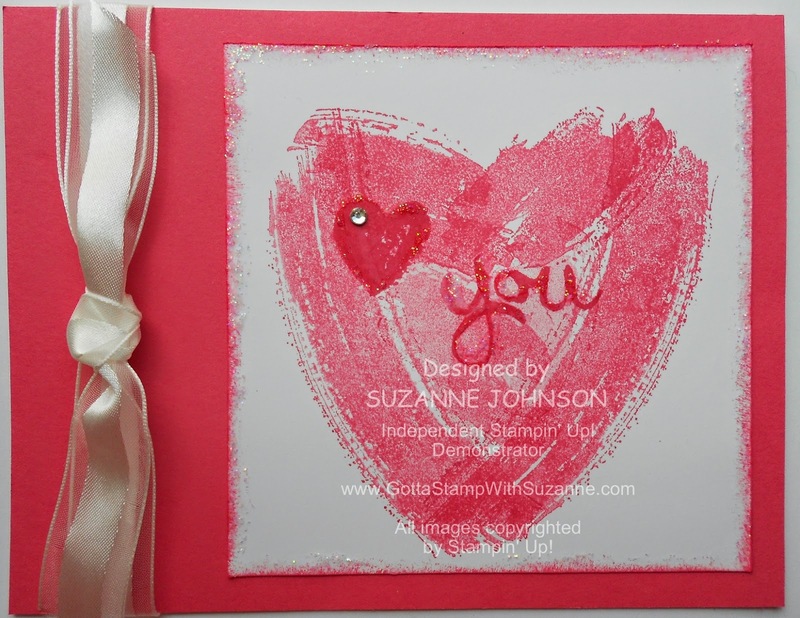 "WORK OF ART" HEART IN STRAWBERRY SLUSH WITH BLACKBERRY BLISS OVERSTAMPING AND BACKGROUND PANEL. 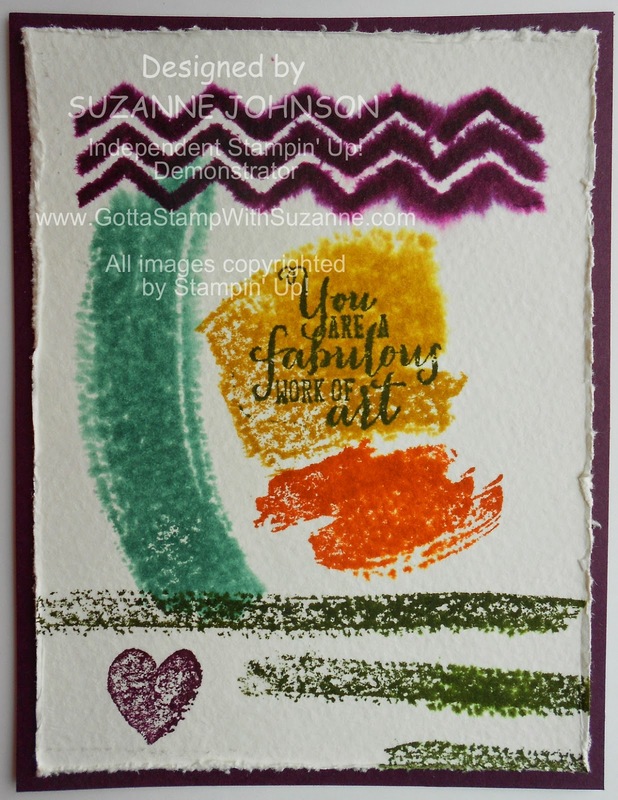 For this next card, I sort of turned the heart upside down and widened it - using the same two stamps plus the "square swipe" (in the center) and Strawberry Slush ink again, I created an apple! The stem is Baked Brown Sugar and just a bit of the line stamp image, the leaf is Pistachio Pudding and half of the heart stamp. The caterpillar is just a series of dots stamped with Pistachio Pudding. The head is a 3/4" punched circle in matching cardstock and I drew the face and legs with the fine tip of a Baked Brown Sugar Marker. The spacing is a little tight, so you want to be sure to stamp the apple close to the left and keep your caterpillar's dot segments close (notice they overlap a little). 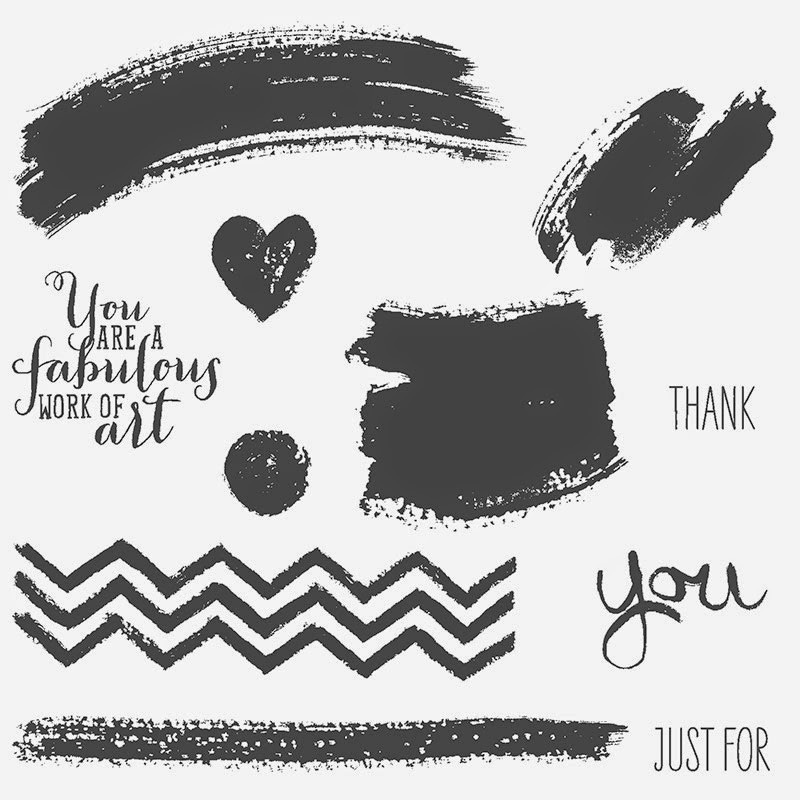 This would be a great card to accompany a gift for a favorite teacher! 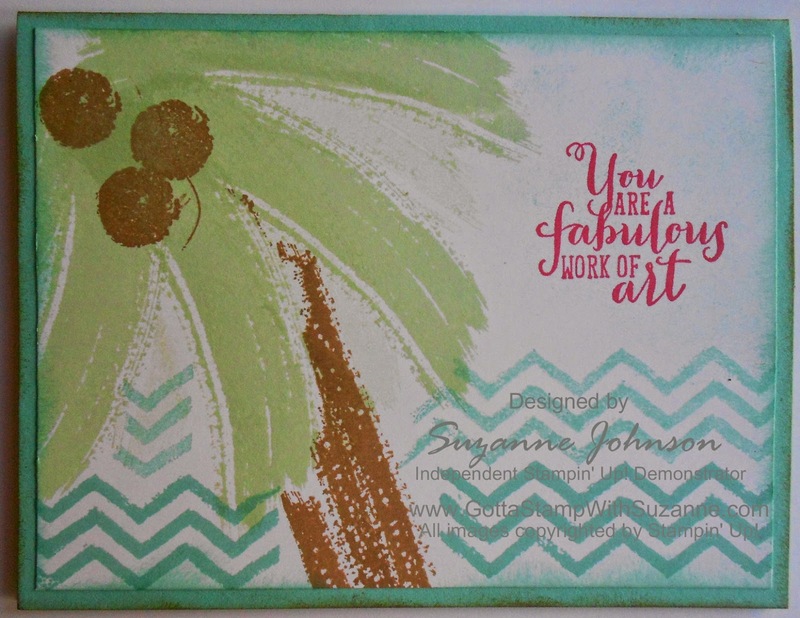 For these next two card variations, I created ocean views featuring palm trees! The first uses only 2013-15 In Colors (Baked Brown Sugar, Pistachio Pudding, and Coastal Cabana and Strawberry Slush). The second one uses 2014-16 In Colors except for the Baked Brown Sugar tree trunk. This design is a little more complicated because I only inked part of the "blotch" image and also stamped-off the Hello Honey ink to make the golden sunset skyline. The coconuts are Tangelo Twist and the dots are each triple stamped to get a darker color on top of the Mossy Meadow palm fronds. 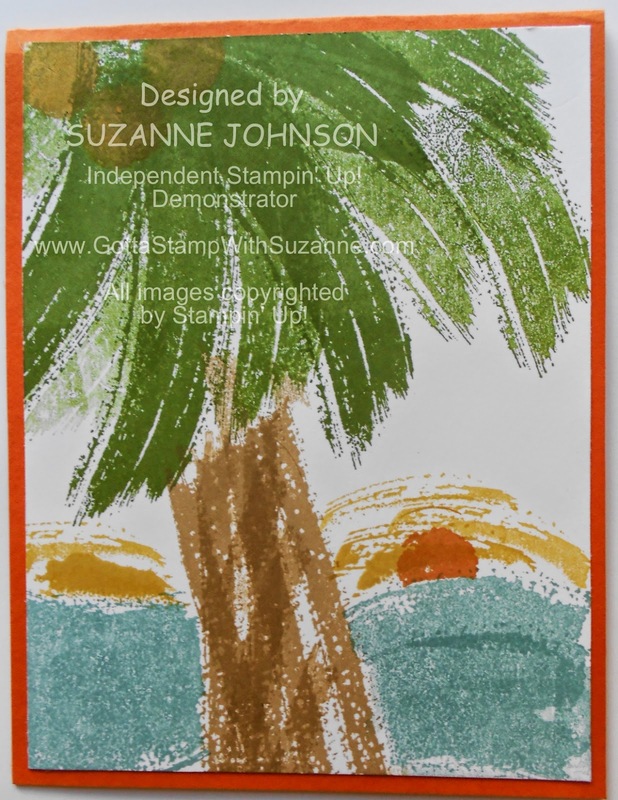 I also used a little masking when stamping the line on a diagonal to add texture and dimension to the tree trunk. I am the MOST proud of the next one, my "Grazing Horse" - although it looks a bit like a child's painting, I actually like that loose interpretation of reality. It reminds me of abstract impressionism. 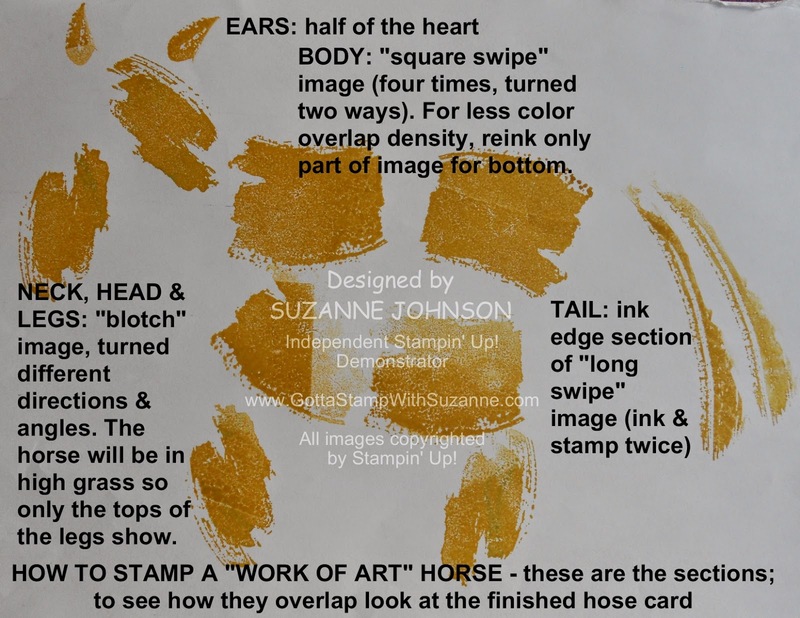 Below the card I have put a "cheat sheet" showing the stamp images I used to build the horse, using Hello Honey ink. 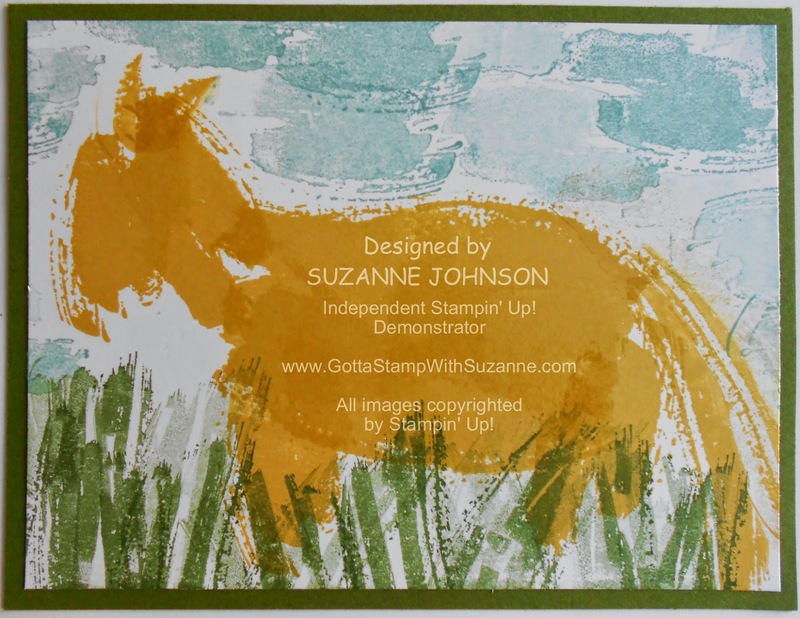 For the grass, I used a Mossy Meadow Stampin' Write Marker to ink the edges and draw lines on one end of the "long swipe" stamp. The sky is the "blotch" stamp and Lost Lagoon ink, stamped off two to three times. To finish off my play time with this set, I did a couple of abstracts using the 2014-16 In Colors and Watercolor Paper. For both I sprayed the Watercolor Paper panel with water, however you will be able to see that I got one panel really wet (causing the images to run a lot), while the other was just lightly damp. I started with the Hello Honey "square swipe" followed by the Tangelo Twist "blotch" on both. I let the ink dry completely before stamping the sentiment. Thanks for visiting and please leave a comment to share what you think of these "Work of Art" designs! I'll be adding point values to the ones that will be available as options to make at my Summer In Color event. Contact me if you would like more info. To order "Work of Art" and/or In Color inks, paper, etc. just click on the shopping button at the top of the right column! These are all just fabulous. Very creative and innovative! Sooooo beautiful, I like your horse! Thank you very much! Thanks for showing me how to look at a stamp set in a different way! Definitely going to try my artistic hand at creating my own art with this set.